Oreganol P73, 0.45 fl. oz. North American Herb & Spice was the first company to introduce edible oil of oregano to the North American market. We are the oregano experts! This is the result of extensive research and the personal experiences of the companyâ€™s founders. To be edible, this essential oil must be made only from wild, mountain-grown Mediterranean oregano, free of all chemicals and pesticides. It also must be emulsified in carrier oil such as extra virgin olive oil, which we use in our oil of oregano. The only oregano we use is the real, 100%-wild Mediterranean oregano, guaranteed to be handpicked in pristine and untarnished remote mountains. A conservation program was implemented to limit excessive picking, which preserves and protects the plants and land. Our oil is produced by old-fashioned steam distillation, using deep spring water also known for its high mineral content. No chemicals or solvents are used in the extraction process. Beware of cheaper grades of oregano oil; the name oregano describes over 60 different types of plants, often having no other similarities with true oregano except taste (like Thymus Capitus from Spain or Mexican Sage). It is the chemical profile that is critical. Oreganol has the ideal profile, which is P73. 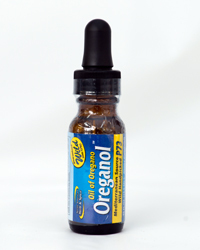 Oreganol P73 is a specific blend of several high-grade medicinal wild oreganos. This P73 oregano has a high percentage of calcium, magnesium, and zinc, which are absorbed from the mineral-rich soil that it grows in. Polyphenol content is a reliable indicator of high-quality oregano oil, carvacrol being the most publicized. But carvacrol is not the only indicator of high-quality oregano, since the plant produces over 50 known-to-date substances which may work synergistically. A low thymol content plays an enormous role in high-quality oregano oil and is often ignored as a factor. Often high carvacrol levels are accompanied by higher thymol levels. To provide our customers with the highest quality oregano oil available, NAHS has blended several species of oregano, creating a delicate, synergistic balance of over 50 phytochemicals. While most, if not all, of our competitors will distract potential customers with claims of â€œHigh Carvacrol,â€ NAHS meticulously takes into account thymol content, as well as other factors, to ensure our customers receive the purest, highest quality oregano oil available. Unless the maker can certify in writing that the oregano herb or oil is derived from pure, wild, edible oregano, avoid consuming it. To ensure that you have the best quality oregano oil, be sure to look for P73 on the label. Oreganol P73 comes in oil and gelcap form, as well as in regular and super strength, which is three times stronger than the regular. Notify me of updates to Oreganol P73, 0.45 fl. oz.